"Growing up on the reservation was different than being raised in the city. 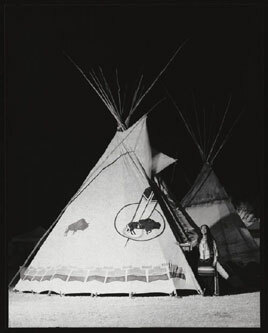 One thing that stands out in my mind is going to Episcopal school and living in a dormitory with other Native children as we were expected to do in an effort to integrate us native into the white world." "The most negative manifestation of white dominance has been the separation of Natives from their spirituality. Spirituality helps maintain balance and harmony with our known Universe." "I think it is a good thing to satisfy the desire some people have to see a full blood Native like myself. There are only 300 full bloods left. I am one of them."